IFA 2013 is scheduled for 6 September 2013, but who says you have to wait till then to see what major IT manufacturers has got to offer. Acer has already started announcing its new products and one of the more notable ones is the refreshed Aspire R7 that comes with Intel Haswell on board and an Acer Active Pen. Like its predecessor, the Aspire R7 comes with a 15.6” touch display and features the same repositioned keyboard and high-definition touch display mounted on a “Exel hinge”, giving it that futuristic look that is cool enough to have its very own Star Trek edition. The new refresh now features a 4th generation Intel Haswell processor and with a new Acer Active Pen on board, users can enjoy greater accuracy and a more comfortable feel when writing and drawing. The Active Pen uses electromagnetic induction technology, making it pressure sensitive so it feels like an actual pen when used, and it also comes with its very own collection of fun touch apps. Acer MemoryBinder is an image editing app with realistic paint brush effects. Acer ScreenGrasp allows users to easily capture any image, personalize it and share it to social networks or even paste them to office documents. Other apps include Acer Scrapboard, and Acer AccuFinger. 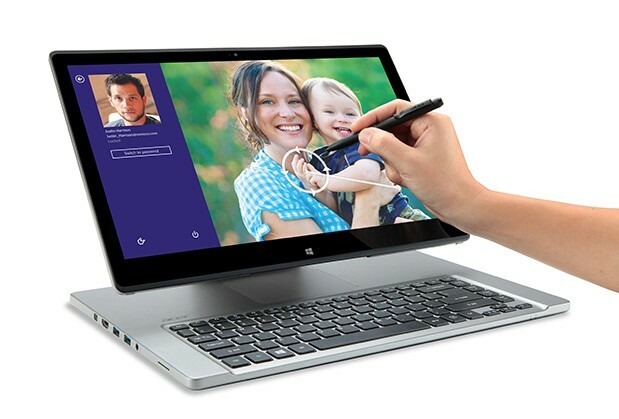 The Aspire R7 will be available in Europe, Middle East and Africa in Q4 2013 with a suggested retail price of €999.